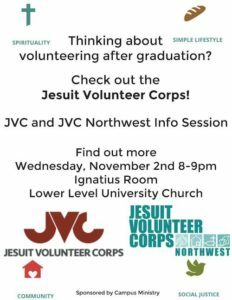 Thinking about volunteering after graduation? Learn more about the Jesuit Volunteer Corps and opportunities to volunteer across the US and throughout the world. 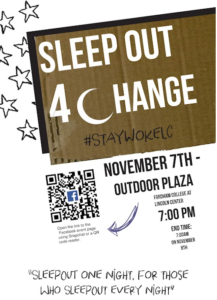 Fordham University’s SleepOUT 4 Change is a campus wide event to raise awareness on homelessness in our community. 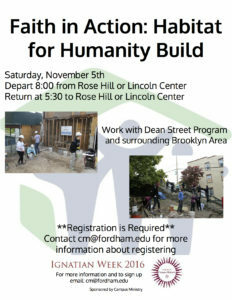 The SleepOUT is not about pretending to be homeless but instead encourages the Fordham Community to stand and SLEEP in solidarity with those in our community who are experiencing homelessness. It is our hope that SleepOUT 4 Change will raise CONSCIOUSNESS around the inhumanity of homelessness and spur our community to take ACTION! Halloween event! 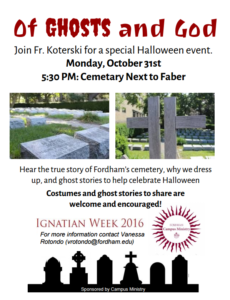 Monday October 31st at 4:30pm at Cemetery adjacent to Faber Hall. Have you ever wondered about the true story of Fordham’s cemetery? Or why we dress up for Halloween? Join Fr. Koterski for an interactive Halloween event. Costumes and ghost stories to share are welcome and encouraged! November 7th at 8:00pm in Flom Auditorium (in Walsh Library)! St. Ignatius was a soldier, a sinner, and a saint. 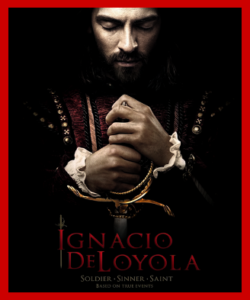 This action-packed feature film explores the years and struggles that shaped who he would later become as the founder of the Jesuits. As a part of our ongoing series “Jesu-Who?” we will be interviewing some of the Jesuits in residence at Fordham. These interviews will allows us to get to know each Jesuit priest better, and offer insight into their lives that we might not usually hear. Keep checking back for new interviews during Ignatian Week 2016! In this installment of our Jesu-Who series, we have the Jesu-new guy on campus, Fr. Mick McCarthy, SJ. Fr. McCarthy arrived at Fordham January of this year, to assume the Vice Presidency of Mission Integration in Planning. Name/Role at Fordham: Fr. Mick McCarthy. I am the Vice President for Mission Integration and Planning at Fordham and an associate professor in the department of theology. What is your field of interest, and where did you go to school? My field of academic interest is early Christian theology, which is called patristics. I went to school in a lot of different places. Stanford, Santa Clara, Oxford, the Jesuit School of Theology at Berkeley and Notre Dame. What is your favorite thing about Fordham? The complexity of it, which I think has a lot to do with it being in New York. I would say I love New York, too. 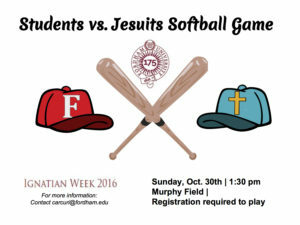 Where do you find God at Fordham? Many places. I suspect I find God in the complexity in life as it is presented to me here at Fordham. As in most places, I find God in the goodness of most people. I find people, even when there are problems, are generally more inspiring. I look forward to finding God more deeply in students when I teach a course next semester. What is the coolest experience you are willing to share? The coolest experience that I am willing to share is, not this summer but the previous summer, I walked 500 miles of the Santiago de Compostela in Spain and I think that was one of the top five experiences of my life. Second coolest experience was when I spent a week rafting down the Grand Canyon. Third coolest is probably jumping out of a plane, skydiving. When you were in kindergarten, what did you dream of being when you grew up? What is the greatest piece of advice you could give a college student? Be patient and realize that it’s not all about you. If you could trade places with any other person for a week with whom would it be and why? The Pope. Why? Because I’d get an insight into the inner workings of the church at the highest level. Probably more important, though, is that it would give me the opportunity to speak to a wide variety on context. I don’t think the coolest thing would be being in charge or the power. I think the coolest thing would be the platform to communicate with a wide group of people. What is the worst mistake you have ever made? Part of me wants to say it was showing ingratitude to my mother when I was a kid. I mean that sounds trivial but it was a serious mistake. Then, kind of aligned with that, just cruel things I did when I was a kid to other kids. In a way, even though sometimes mistakes that I have made have had greater impact, in a deep way, I would consider those ones worse. What is one subject you wish you had more of an opportunity to study? Economics. My education is pretty deep, but I think a major gap is missing economics. What would you say is one thing you think everybody should do before they die? I would say learn to love deeply. Yes. My best dish is butterflied leg of lamb. How did you know you wanted to join the Jesuits? In the context of my growing up, I was taught by Jesuits and it struck me as a group of people that were both devout and worldly at the same time. Having the example of people, who were that way, really helped me in my own faith. I don’t know there was ever a moment where I knew I wanted to become a priest, but there was a moment where I knew I wanted to enter this religious community of the Jesuits. 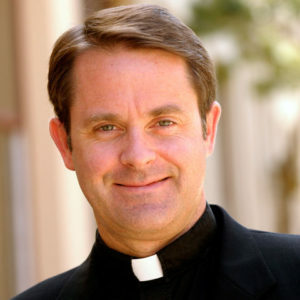 I think in the context of being a Jesuit, I found that being a priest was a way of deepening my commitment as a Jesuit. Certainly then, since being a priest, that’s how I knew I wanted to be a priest. I love the network of relationships that it puts me in and the opportunities it puts me in and the quality of people that I have met in these really privileged ways. Honestly, the desire to become a Jesuit came first and the desire to become a priest was an outgrowth of that. Name/Role at Fordham: Fr. Joe Koterski, Jesuit priest, teacher in the Philosophy Department since 1992 and the Master of Queens Court. I’ve resided there since 1994 and it is a joy to be there. I have an abiding interest in philosophy and theology but also in classical languages and classical literature. I went to college at Xavier University in Cincinnati and then to St. Louis University for my graduate work in philosophy. After that, I taught for two years in Texas, where I taught Greek philosophy at the University of St. Thomas. Only after that, in 1984, did I join. I was ordained in 1992 and I came to Fordham right after ordination and I have been here ever since. In literature I have a special interest in Shakespeare and Dante. I have often lectured and published on them. What is your favorite thing about Fordham? 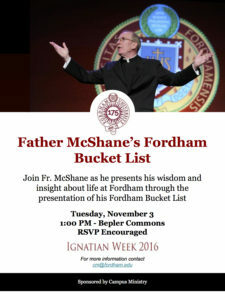 Where do you find God at Fordham? Certainly my favorite thing about Fordham is living at Queens Court. It is a great joy to live with the freshman students and especially those in Queens Court because of the interest and the commitment they have to be a part of that community and to take part in our activities. It is a place where residents pledge to observe the substance abuse policies of the University, and the freedom from those distractions makes for the possibility of real freedom for integrating their academic life and their social life. I enjoy being a part of that. Just last night, for instance, I was working with the students who volunteered to be part of the Disputatio, which is our formal debate. This fall’s debate is going to be on gun control and specifically, the Second Amendment. We spent an hour last night thinking of a topic and trying to hone it to a proposition, as well as thinking a little a bit about debating strategies. It’s that kind of work that I very much enjoy. I find God especially through Mass and the other devotions that we have here. I regularly offer Mass at the University Church. During the week, I offer Mass on Monday nights at Queens Court and generally on Fridays over at the Blue Chapel over in Keating. That work is important to me, as is hearing confession. I do this on Fridays at the noon hour in the University Church. It’s a special place in finding God because when people choose to come to confession, it is because they have a sense of their need for reconciliation and forgiveness. I take delight in this as a way to be the instrument of grace for the church in those occasions, and I find God myself in those conversations. Yes. I have two big projects at the moment. These will especially entertain me next semester when I will be on sabbatical and may have a chance to finish them. One is a book on the philosophical underpinnings of Catholic social teaching. Catholic social teaching nowadays tends to take the form of encyclicals. They are offered not only from the point of view of revelation, but also from the point of view of reason. sometimes by the natural law and other philosophical methods The book I’m working on is the philosophical underpinnings in Catholic social teaching. The second project I’m working on now is one on which I am going to serve as the general editor of a book called “Theism and Atheism”. There is one editor from the theism side and one from the atheism side. We are going to have fifty articles on each side. The job of the editor is to identify the topics and then find the contributors and then edit what they all contribute. We hope to have it finished by the end of next year. My favorite movie of all time is Amadeus. It’s a story about Mozart and Salieri, a composer who lived at the same time as Mozart. He was insanely jealous of the young Mozart for his absolutely brilliant accomplishments and his virtuoso performances. He was so jealous, in fact, that he concocts a plot to try to hasten Mozart’s death but, at the same time, to steal from him a composition that he had commissioned from Mozart under the veil of secrecy. Now, besides this being a really interesting story, the film has glorious scenes and glorious music. Mozart’s music is unbeatable. I love it for its music and its wonderful scenes and costumes. I’m fascinated by the plot. As a priest, I find it interesting because the whole story is told in the form of a general confession. The movie opens with a young priest who is going to an insane asylum where Salieri lives at the end of his life. He has to do a little bit at the beginning to get Salieri talking, but when he does, the whole rest of the film unfolds as the story of Salieri’s meeting Mozart and being jealous of him, and concocting the plot, carrying out the plot. His whole motivation comes from his envy of Mozart’s genius. There are all kinds of flashbacks to earlier events but from time to time the film cuts back to Salieri telling his story to this priest in confession. Among the funny scenes is one in which the priest is shown utterly worn out in his chair trying to listen to all this It is a delightful movie and I hope that you get a chance to watch it. This is a book by Fr. Paul Quay called The Mystery Hidden for Ages in God. Father Quay was a Jesuit who was an expert in the Spiritual Exercises. His book addresses the question, “why is it that Christians are often no better than pagans? Why is it that Catholics are sometimes no better morally than most other people ?” One would think that their faith should give them some advantage or have some important effect. What Fr. Quay does is to give a deep understanding about human nature, including a very interesting understanding of original sin. The balance of the book, chapters 7-20, is an account of the theory of recapitulation. The idea of recapitulation is to focus on the life of Christ that is recounted in the New Testament, and to see his life as the principle for understanding all the other events in the Bible. Think of the life of Israel as if it were one lifetime, even though it takes place over many generations. At each point, Christ’s life recapitulates the life of Israel. He completes what is incomplete, He perfects what is imperfect, and He sanctifies what is sinful. This is what we mean when we say, for instance, that Christ is the new Adam or that Christ is the new Isaac or that Christ is the new Moses or that Christ is the new Job. To me, it is not only theoretically interesting for how to read the scriptures, how the New and the Old fit together, but it has really practical advice about human formation and specifically spiritual formation as Christians. We are supposed to imitate the pattern of Christ and grow through the stages of life. I have found it useful in any number of spiritual direction sessions, in any number of sermons, in any number of conferences that I’ve give, It is the single most important book I’ve ever read and I cherish it. What is one subject that you wish you had more of an opportunity to study? I wish that I had had the opportunity to study brain chemistry. As a philosopher, I’m very interested in how it is that thinking works. Thinking is an immaterial activity, but it depends on the physical constitution we have, including the brain and the rest of our body As a philosopher, I’m committed to the position that each of us is a single being, body and soul, matter and form, mind and body together. I do a lot on this issue on the philosophical side. I wish I had had done more study on the side of physiology. How did you know that you wanted to become a priest? Why the Jesuits? I’ve known I wanted to be a priest ever since I was in the fourth grade. The original impetus came simply from the beauty of the liturgy. At that point we were not yet doing the form of Mass that we now normally use. The older form of the liturgy, like the current form, is very beautiful and I was very attracted to it for that. But as a fourth grader you don’t know all of what is involved in the life of a priest. By the time I was ready for high school, I decided to go to a school that would let me get the kind of education in classical languages that would be of use for a priest. I wasn’t ready to make the decision even at the end of college, and so I did my doctorate in philosophy and then taught for two years down at a university in Texas. But, finally, when I was already about 29 or 30 , I had the occasion to make a retreat, a thirty day retreat, the “Spiritual Exercises.” Part of what moved me to make this retreat was the need to make a decision. There was a young lady I was thinking of courting. I said to myself, “If you go courting, you go courting to win”. That is how courting works. So, I needed to know if I was going courting but I had always cherished this idea of priesthood. So, I asked a friend of mine, Fr. Quay whom I mentioned above, if I could do a retreat with him, and he agreed. I went up to Chicago for a month in the summer in between my first and second year of teaching down in Texas, and made the Spiritual Exercises. He was a very good retreat director. To help me with trying to figure this out, he insisted that I really open myself to what the Lord wants, and so I tried to do that. It became clear, within a pretty short time, that I really should seek the priesthood. But then he gave me a wise piece of advice: don’t go putting any name on it, like Jesuit or Benedictine or Dominican or whatever. And instead, he told me to try to figure out, as best as I could what sort of things God wanted me to do and to get a picture of the life without worrying about the name of the group. So I spent the rest of the retreat doing that and by the end of the retreat, I had about a three-paragraph description of the kind of priest, the kind of group I wanted to be with, but I had no idea what the name was. So after the retreat finished and I was quite solid on what I was supposed to do, then the research started about what group to join. I was back in Texas at this point. It turned out that I had reinvented the Society of Jesus, but I didn’t know that until I started doing careful research. It wasn’t enough to just know what Jesuits did, it was important to really understand what the structure of this charism, what the structure of the life was. When it was time to make a choice, I was able to choose in accordance with that clarity, and it’s part of why I’ve been so happy and so delighted to do the kind of work that I do. The key point, for me, was was twofold. One was that I wanted a group that was really directly evangelical. This could mean missionary or direct service of the church, promoting the Gospel. But secondly I was also looking for a group that worked on the spiritual care of the faithful, confessions, retreat direction and spiritual direction. In the course of doing the research, I found out that those are the distinctive elements of the Jesuit charism. It is a priestly community focused on missionary evangelical work, that it takes care of the faithful by confession and spiritual direction with retreats. Even the reason why we are in education so heavily in the US is to support the church here. The church needed schools and learned people in the schools to give its people a real education in the faith. That is why we came to be so heavily committed to education, but the schools also provide a wonderful opportunity for retreats, for confession, for spiritual direction, and so I have been able to combine both of these goals. I find it, not only by the work with Campus Ministry in various ways but also in the classroom. Being here in NY, I have wonderful opportunities for many great opportunities of an evangelical nature, and so I feel that I am able to live this out in a way that is just exactly what I dreamed of. 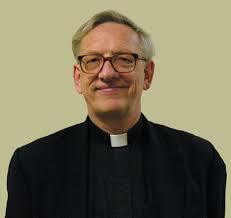 Our first installation in the “Jesu-Who?” series is an interview with Fr. Lito Salazar, SJ, who is beginning his second year as the Executive Director of Campus Ministry. Read below to learn more about him. Suppose you find yourself amidst an awkward silence. What is the first thing you do? When confronted by an awkward silence, I endeavor to sit with it for a couple of minutes. Word-less, thought-less, I am compelled to attend to it, letting it claim its existence. But only long enough before my mind turns into a beehive. I am after all, in the midst of a conversation. What kind of ‘awkward silence’ is this? A revealing one? Who, and what was bared? A painful, graceless awkward? To whom, and why? Or, is it a grace-filled ‘awkward’ because uncommon, as of a heavenly messenger reaching down, inviting to wholeness, to communion in the silence of a holy night? All this, of course, takes only milliseconds to process. Then I break the silence, or impatiently wait for another to do it first. But too soon, far too soon! If only there was more silence to get used to and be used to, then maybe, just maybe, it wouldn’t be awkward at all. It would simply be… silence! Do you speak any foreign languages? If so, which ones? If no, which would you like to? From silence to audible speech. I do speak “foreign” languages, but not all foreign to me. Waray-waray is my default language after English. It is spoken in my home region of east-central Philippines. Spanish was spoken by my extended family during my early childhood, but English supplanted it quickly as the national language of instruction. I still read and understand Spanish, but I have difficulty speaking it. Philippine languages are Indo-Malay based, but with a significant assimilation of Spanish vocabulary, making it difficult to separate out. Instinct makes me speak in a Philippine dialect when someone addresses me in Spanish. I picked up fluent Visayan (also called Cebuano) in high school, the widely spoken language in the central and southern regions. I consider Tagalog, the language of the capital region of Manila, my first official “foreign” language because it was mandated by the government from middle-school on to high school. I became fluent in it only after college. My first career with an international petroleum corporation introduced me to Dutch. I got on with a muttering of it while doing my doctoral studies back in the Netherlands. Theological studies introduced me to reading or translating passages in Latin, Hebrew, and Greek, but never as spoken languages. One subject that you wish you had had more of an opportunity to study. English Literature. I grew up surrounded by books. My mother taught English and Spanish Literature in a local Catholic university run by American and German missionaries. My father lined our walls with paperbacks (Westerns, mystery, suspense), National Geographic, and Readers Digest. A lazy day would find us sprawled out reading, reciting poems from memory, and then hiding books and newspapers from each other. There never seemed enough to read because we didn’t get television until I was in college. By then, my chosen science major in Chemical Engineering wrenched me away from my first love!